Breeder’s Formula® is a concentrated nutritional supplement formulated by veterinary nutritionists to promote healthy skin and reduce nervous behavior in dogs. It is the result of many years of veterinary research into the nutritional needs of animals with skin problems. 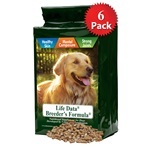 This product is safe and effective for all breeds and ages, including pregnant dogs. Dogs with skin problems often have dull hair coats, patches of hair loss and itchy skin. The constant itching, scratching and chewing contribute to nervousness and anxious behavior. Flea allergy dermatitis, food allergies, and bacterial infections of the skin can lead to staphylococcal dermatitis, hot spots, seborrhea, and a stinky dog! The average dog’s diet is deficient in many of the nutrients needed to build healthy skin. 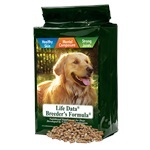 Breeder’s Formula® supplies these needed nutrients to help strengthen connective tissue proteins, especially collagen, thereby improving the skin’s resistance to dermatitis. Breeder’s Formula® also contains tryptophan and magnesium to reduce nervous behavior in dogs and lessen compulsive itching, licking, and skin chewing. One 17.6 oz. 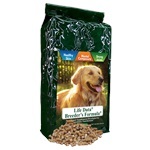 bag of Breeder’s Formula® is a 78 day supply for the average 15 to 29 lb. dog.